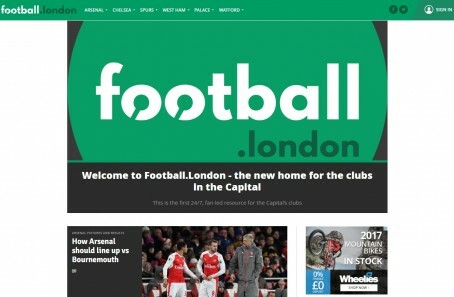 A new website aimed at London’s football supporters has been launched by a regional publisher. Trinity Mirror’s Football.London went live yesterday morning, promising to “put fans at the heart of what we do”. The website has vowed to offer news and discussions for readers wanting to know about latest team news “as much as they do the travel and ticket details for European trips”. Its homepage features individual tabs for the six Premier League clubs based in the capital and surrounding area – Arsenal, Chelsea, Crystal Palace, Tottenham Hotspur, Watford and West Ham United. The site is edited by Tom Marshall-Bailey, who previously worked for Trinity Mirror dailies the Huddersfield Daily Examiner and Liverpool Echo before taking on a group-wide live sports editor role in March 2016. Seven new roles created for the project were advertised on HTFP last month. Said Tom: “I feel privileged to have been given the opportunity to launch Football.London. “This is the first 24/7 fan-led resource for the capital’s clubs, providing London with a digital home for clubs from the top flight to non-league. “This is a space where fans can connect; we are offering them the platform to have a voice and debate the topical issues surrounding each of their clubs. Jon Birchall, head of digital sport at Trinity Mirror Regionals, added: “We have seen remarkable growth in our digital sports audience over the past 18 months, reaching millions of supporters every single day. “The launch of Football.London is the next natural step for us to continue building on our industry-leading regional sports following, giving a digital home to the capital’s football fans. Because there isn’t already enough coverage of Premier League football in TM regionals, obviously. Woe betide anyone with a thirst for proper reporting on any other sports on their TM regional patch. Their cricket and rugby coverage has slipped badly to the point where I no longer buy my regional paper or bother checking their website. Yes, I know, it’s driven by click numbers, but there is surely still a value in quality specialist reporting on other sports rather than the tedious ‘here are 5 midfielders Tottenham might not buy’ listicles. What a dreadful lash up this is. The only consolation is it doesn’t feature Robbie Savage – yet. It only features London Prem sides – can’t you be bothered with Fulham, QPR, Brentford, Charlton, Millwall & Orient?